We are 15 years old! To celebrate, join us as we take a look back to where it all began. LeKtronix was established in August 2002 in Aldridge. We are still located at the same address, although the workshop has gone through lots of changes and it is now twice the size! Donna our UK Sales Manager said "Everyone just pulled together, it was very small, we only had 8 engineers". We expanded quickly across EMEA opening a branch in Ireland in 2005, an International branch and Czech Republic branch in 2007 and a branch in Poland in 2008. We now have over 280 employees across 8 facilities repairing 1000+ items each week. 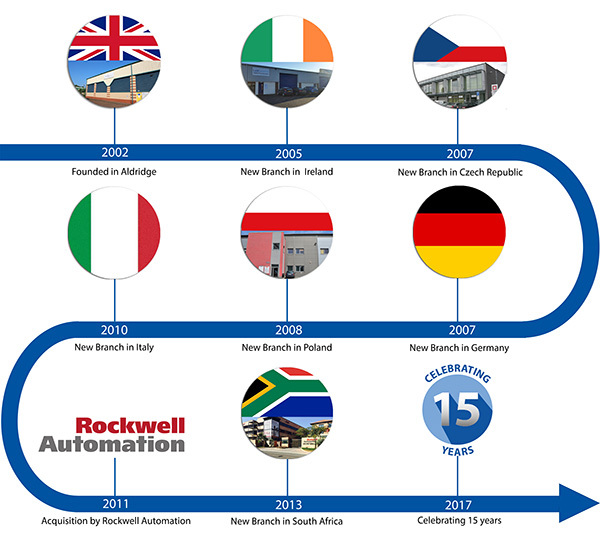 In 2011 Rockwell Automation acquired LeKtroniX to accelerate the growth of the Rockwell Automation service business in Europe and further expand customer presence in emerging economies. Our presence and technical expertise in third party repairs complements and enhances Rockwell Automation's already established and proven MRO optimization solutions. Rockwell Automation and LeKtroniX’s joint capability offer existing customers a more comprehensive service offering, strengthening customer intimacy and producing opportunities for product and service conversions. Our workshops and custom built test rigs have the latest technology. Our highly skilled engineers are equipped to repair a broad range of parts. Speak to one of our sales representatives in your language. All our repairs and spares come with 12 months whole of unit warranty.